The Florida Sea Turtle Life History Posters Project was funded by a grant from the Sea Turtle License Plate Program. This project involved the development and distribution of a life history poster for each of the five species of sea turtles found in Florida. 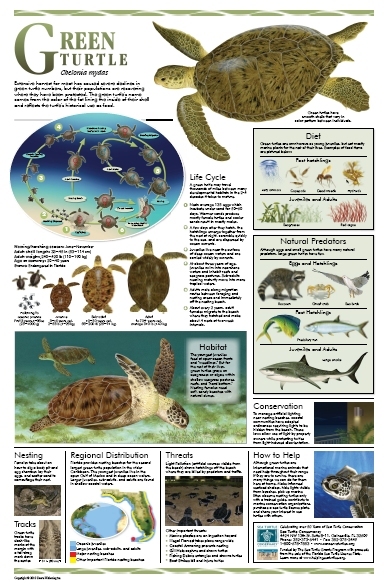 A set of posters is being provided at no cost to Florida sea turtle groups, rehabilitation and educational facilities, schools, environmental centers, libraries, and other Florida based groups requesting the materials. Each poster is 3′ tall by 2′ wide. Currently, printed posters are only available in Spanish and can only be shipped to a Florida address. If you are looking for English Versions of the posters, you can download and print out a PDF version. If you are outside of Florida and looking for Spanish Versions of the posters, you can download and print out a PDF version.